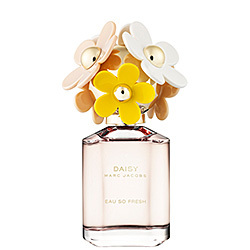 I have been getting really into perfumes in the last couple of months, and my favourite perfume of the summer has been Marc Jacob's Daisy Eau So Fresh! I love this perfume bottle, it's so fun and girly! "A whimsical interpretation of the original Daisy fragrance, this scent is more fruity, more bubbly, more fun! Open the bottle and you'll be transported to a field of sunshine that bursts with the flirty scent of flowers and the cheerful sweetness of fruits. Its light, woody base infuses a subtle but sharp glimmer of musk for an unexpected twist of radiance. Fun to look at, touch, and open, the gold top of the weighted glass bottle is covered in six soft-to-the-touch daisies with petals in white, pink, and yellow. Notes: Natural Raspberry, Grapefruit, Pear, Violet, Wild Rose, Apple Blossom, Musks, Cedarwood, Plum. This perfume is perfect for the Spring and Summer months, since it it very light and feminine. I wouldn't choose this scent for a night out, I prefer to wear it during the daytime. I've already used about 1/4 of my bottle, and I've only had it a few months! I've been wearing this scent about 6/7 days every week, occasionally switching it up! Marc Jacobs recently released a new scent, Dot, which I love and I know I will eventually pick it up. I can't wait to get it for myself :) I love Marc Jacob's perfumes! Beautiful bottle but I have not tried this one yet! Love the bottle but haven't tried this yet! I love Jennifer Aniston and Kate Spade Twirl for the summer! They are my absolute favorite! I love Jen's perfume as well :) You definitely need to get a sample of this from Sephora to try out, it's amazing!